Perks: Ex wife claimed he chowed down for free at downtown restaurants. WHEN RON GONZALES became mayor of San Jose, he sat in nosebleed seats at 49ers games and putted at the San Jose Municipal Golf Course. Now he's rubbing shoulders with billionaires at "the next Pebble Beach"an exclusive championship course in San Martin where memberships cost a quarter-million dollarsthanks to his generous lobbyist friends. While community members, local business people and members of the media can only hope for a return call from His Mayorness (he was way too busy with more important matters to talk to us for this article), his silver-tongued buddies get hours of quality face time in a gorgeous, relaxed setting far from the earshot of the pesky media or others concerned about access, ethics and influence. Afterward, they can enjoy roasted John Dory over baby eggplants with roasted red bell pepper sauce prepared by chef Vincent Russo, or a fat, moist stogie in the cigar room. Most Metro readers will, of course, never get to golf at the Corde Valle Golf Club. The county Board of Supervisors released Corde Valle from its original use permit requiring the luxury resort to reserve 60 percent of its tee times for any scruffy member of the public who wanted to swing clubs in the beautiful hills of San Martin. So how does our humble public servant, who plans to hold his wedding at the posh golf resort in early September, get to play there on his government salary? Well, when the club got into a pickle over its public-spirited open-access requirement and needed to make it a place where CEOs like Cisco's John Chambers could enjoy private recreation, it hired a clump of consultants: Gonzales campaign treasurer Ash Pirayou, former Vice Mayor George Shirakawa and Gonzo's ex-chief of staff Dustin DeRollo, along with affable, well connected lobbyists Tom Saggau and Jerry Strangis. The consultants now get their green fees comped at the 18-hole Robert Trent Jones Jr. championship course amid a backdrop of rolling hills covered with vineyards and California oaks. DeRollo, who says he's golfed with the mayor there four to six times in the past 18 months, says he usually plays a foursome, but his memory failed him when asked for the names of their other golf partners. "I've taken a number of folks out there, so I don't keep track," he explains. DeRollo confirms that he and the mayor golf for free because of his firm's "in-kind" services agreement. "Basically, we are expected to take care of the caddies," DeRollo says. To keep things kosher for the alcalde, "He tips the 'guest and member rate,' $85." In other words, Gonzales overtips ($10 to $40 is customary) to approximate what he should have paid in green fees, were his lobbyist/former employee friends picking up his tab in cash instead of bartered services. County Assessor Larry Stone, who moonlights as a developer in San Jose, says he golfs with the mayor around eight times a year at courses like Cinnabar Hills, Boulder Ridge, San Jose Country Club and Corde Valle. Who pays for the mayor's rounds? "I assume he pays," Stone says, then allows that sometimes the two elected officials cover each other's tabs. "I have paid; he has paid," Stone says. Precisely these kinds of casual, unrecorded cash transactions between public officials and influence seekers are among the practices that brought scrutiny to Councilman Terry Gregory last month. 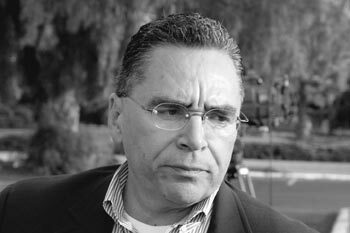 Sources say that District Attorney George Kennedy's office is looking into the mayor's golfing with lobbyist and former mayoral staff member Tony Arreola, who recently received $240,000 for his services as a consultant during the Tropicana eminent-domain debacle, a failed venture that cost San Jose city government millions. Arreola is also under investigation for alleged violations of the city's revolving door ordinance. Neither Kennedy nor Deputy District Attorney Julius Finkelstein would answer questions on the Golfzales case. "We generally don't comment on investigations of elected officials," said Finkelstein, the individual designated to handle the investigation, if one exists. Arreola golfs with the mayor every other week, according to one Gonzales golfing partner. He alternates with Victor Arrañaga Jr., a registered lobbyist who recently left telecommunications giant SBC to work for Applied Materials. Even though the mayor golfs with people who influence millions of dollars in city decisions, the mayor's golf life is an official secret. Golfing dates are scrubbed from appointment calendars released to the media. Mayoral spokesman Dave Vossbrink noted that "personal" appointments were redacted from the calendars, and the mayor ignored faxed, emailed and telephoned interview requests and question lists requesting detailed information about the mayor's tee times, golfing partners and payments of golf green fees. It's hard to keep secrets in public life, though. The mayor's jilted ex-wife, Alvina, disclosed in a divorce document "Ron played golf two times per week." Courses included the $350-per-round Pebble Beach resort, one of the stops on the PGA tour, a course Ron played "on occasion." In a section subtitled "Perks of Being Mr. Mayor," the document revealed, "While married, Ron and Alvina ate dinners almost four times per week. They ate at a lot of the downtown restaurants. They always had wine and dessert with their dinners. They never received a bill, but on average the dinners cost $200." The monthly cost of the free dinners was estimated at between $2,500 and $3,464 a month, though that may have been exaggerated in hopes of increasing alimony payments. Divorce papers and mayoral calendars provide a long list of entertainment activities ranging from World Series games to Rolling Stones and Ricky Martin concerts. However, only a handful of items from Gonzales' vida locawhite tablecloth cuisine, sports and music events and A-list golfingappears in the California Form 700 Statement of Economic Interests that Gonzales must certify as correct each year under penalty of perjury. For example, in 2003, Gonzales disclosed just five opera and musical theater tickets as gifts, along with a $66.40 luncheon at the California Chamber of Commerce. The year before, the only reported gift was $137 in tickets from San Jose's American Musical Theatre, and, in 2000, the sole gift was a $2,700 junket to a Fannie Mae conference in Washington, D.C.
Gonzales, through his spokesperson, declined to respond to detailed questions about his golfing, citing the week's lengthy council agenda. His press office, however, helpfully volunteered that the mayor is indeed a golfer. "Ron golfs mostly on weekends as personal recreation, although over the course of a year he participates in a couple of charity tournaments." While dodging the nine written questions, press handler Vossbrink added his personal observations, "I can see genuine benefit in the health and attitude of the mayor when he can dial in time for himself to get ready for the week ahead." "Ron confirmed to me that he is not a member of any golf or country club ('... on my salary?' he laughed) but that he pays his own way for greens fees, tips and related golf expenses," Vossbrink wrote. Vossbrink assures the people of San Jose that no municipal decisions are influenced in the gated confines of San Martin. "He has often said the most enjoyable thing about golf is that you get to spend the day in a beautiful place with close friends and leave the office and business far behind. The last thing he wants to talk about while driving and putting is business." Golf buddy Arrañaga echoed that party line. "Golf is for golf. That's his rule number one," he said. "If you bring up business, it'll be a year before you play with him againif ever." If that's the case, it's coincidence, then, that the only friends the mayor can find to go golfing with happen to be people who are paid to be friendly with political decision makersand have memberships at some of the world's best golf courses.